Let me first give a very well deserved compliment to the Directions committee. They have done a really tremendous job. Almost 1000 attendees, over a 100 sessions, a strike at the airport of Copenhagen so speakers couldn’t make it on time, it was definitely a very tough week. Congratulations, well done! And I wish you every success with organizing the event next year in Poznań, Poland. With this post I would like to share some details about multitenancy, one of the new major changes in the architecture of the NAV Server Tier. Version 2013 R2 introduces the concept of multitenancy to Microsoft Dynamics NAV. This is a principle in software architecture where a single application instance serves multiple client organizations (tenants). It differs from multiple-instance architectures where each client organizations has a separate application instance. Multitenancy is considered to be an important feature of cloud computing. It enables a maintainable and scalable application. 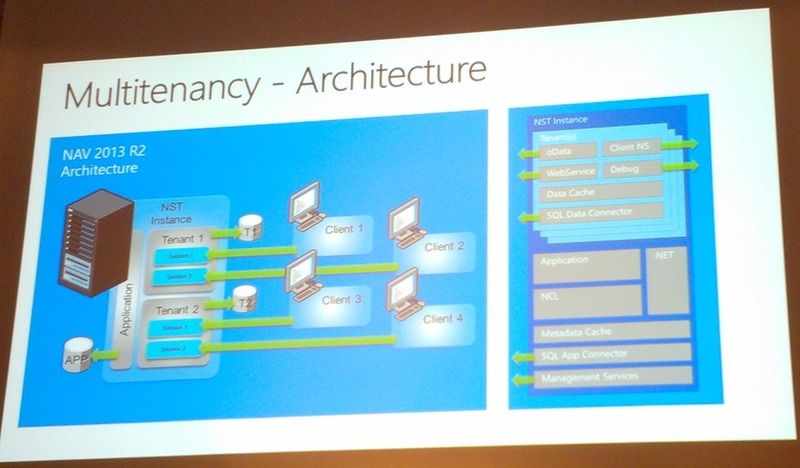 The multitenancy architecture is a repeatable architecture, which exactly matches the goal for Microsoft Dynamics NAV. The challenge for the Dynamics NAV team was to design an architecture with thousands of tenants that only occasionally access the system. They have reviewed different scenario’s like multi-company, multi-instance or multi-server. Multi-instance, e.g. multiple NAV Server instances on one server was tested. It scaled nicely up to 7 servers, but then became rapidly slower and slower. Not a good alternative for a repeatable scenario with thousands of customers. The only architecture that addresses al the challenges appeared to be a multitenancy architecture. The multitenancy architecture in NAV 2013 R2 consists of a single application database and multiple data databases. The application database only serves as a source for metadata and source code. Data is separated in tenant databases. One NAV Server Tier (NST) can serve one application database and multiple tenant databases. At the other hand the application database and tenant databases can be opened by multiple servers. They even can sit on different SQL servers. This makes the model very flexible and scalable. The NST can run in two different modes: single tenant or multi tenant mode. The single tenant mode is what we know from NAV 2013 RTM and NAV 2009. It is still available and as such it is backward compatible. The multi tenant mode enables new capabilities. License can be in the tenant database and in the application database. When the tenant has no license, then the license from the application database is used. It is possible to have tenant and application in the same database, but that seems not to be very logical. Standard single database deployments (no multitenancy, one database per NST) have in fact one single tenant, called the default. The system tables are separated. The application database and tenant database have a different set of system tables. De Development Environment can only access application databases. Tenant databases cannot be openened in C/SIDE. Since every tenant is a regular SQL database, it is possible to individual backup a tenant. The NST is responsible for applying changes in the database schema to the tenants. This means that importing a fob in the application database will not immediately change the database schema. The Development Environment is only responsible for updating the metadata. It depends on how a tenant is mounted if a change in the database schema that would result in data loss will be forced or not. If not, the tenant that would have loss of data will be dismounted. Therefore it is extremely important to be very careful with updates in a live environment. When unmounted tenants are mounted again to a NST, the tenant will be updated to the latest database schema. In the normal single database deployment the Development Environment can ask the NST if an update would result in loss of data and immediately show an error, just like it is today. The NAV environment can be managed by using PowerShell commandlets. There are cmdlets available for management of tenants. This varies from deployment of new servers to create or copy a company in a tenant. There are How-to scripts included on the DVD to show how these cmdlets can be used. This post is based on the notes I made during several sessions and workshops. So I might have missed a couple of features. Nonetheless, this is the big picture, and I will try to dive into details in future posts. Stay tuned! How many tenants can be hosted in one server? What mean the phrase: “the challenge for the Dynamics NAV team was to design an architecture with thousands of tenants that only occasionally access the system.”? If we have tenants used very frequently? With NAV 2013 there is one Service Tier per database. Having multiple database results in multiple service tier, each consuming some memory. Because you don’t know when and how often users access the database, it is not very efficient to reserve memory that could be reused in other processes. So the challenge was to have multiple tenants available with users the logon and logoff at unpredictable moments without having to reserve system resource when they are not using the system.